Rob Roy didn’t get their league campaign off to the start they wanted as they crashed 4-0 at Cambuslang Rangers on Saturday, writes Neil Anderson. Cambuslang celebrated their return to the top-level league after an absence of 25 years with an emphatic victory over a Rob Roy side that fell out of the game in the second half. The Roy were forced into an early change when keeper Michael McKinven injured himself in the warm up and was replaced by Andy Finnigan. But the visitors started brightly and should have taken a third minute lead but Cambuslang keeper Iain Stewart did well to save Connor Hughes’ shot and Willie Sawyers’ follow up hit the side netting. The keeper was then backpedalling soon after to push a Michael Morris bouncing effort over the bar. In a period of Rabs pressure, Joe Slattery fired wide from a David Waters throw-in before the Lang came back in to the match with John Gemmell sending a 20-yard free-kick against the Roy’s defensive wall. On the half hour mark the dangerous Callum McRobbie saw his shot blocked for a corner before Stewart was again called in to action to save a Martin McBride effort following a Lee Gallacher corner. Seven minutes before the break Rabs keeper Finnigan brilliantly tipped over a McRobbie drive and from the corner Gemmell headed wide. Rabs suffered another injury setback on the half time whistle. Jordan Currie-McLean sustained a bad head injury and was led in to the pavilion with blood streaming from the cut and was replaced for the second half by Graeme Ramage. After the fairly even first half, the home side that started the second half the better and took the lead in the 51st minute. Finnigan beat away a Gemmell shot, but from the resultant corner kick David Green rose above Waters to bullet his header in to the net. The pressure from the Lang continued and Craig McLeish sent a drive over the bar from distance as they looked to extend their lead. It did not take long. In the 56th minute McRobbie’s shot found the net with the aid of a deflection off Danald Zekaj. The visitors tried to respond and Sawyers was brought down just outside the penalty box but Gallacher’s free kick was blocked. Cambuslang made it 3-0 in the 64th minute when a Craig Hastings corner fell to Jordan Morton at the edge of the box and he fired low past Finnigan. Rabs came close in the 76th minute when substitute Sam Mackenzie’s drive clattered the home upright but it was the home side that added to the scoring with six minutes remaining. Substitute Jason Thomson ran through on goal and although Finnigan managed a touch on the ball the momentum saw the ball trickle into the net. Cambuslang collected all three points with a superior second half display as Rob Roy’s defensive frailties were again exposed, leaving the visiting supporters full of worries for the season ahead. 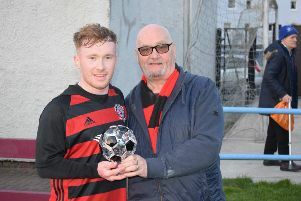 Sponsor John McKean presented the Supporters’ Man of the Match trophy, kindly donated by Roddy the Dog Walker, at the end of the game to Joe Slattery.